Bimetallic Thermometer and Ordinary Thermometer Difference - SILVER AUTOMATION INSTRUMENTS LTD.
As manufacturers of the bimetallic thermometer, it is necessary to acquire some general knowledge of thermometers. Some people may know only little about thermometers and keep asking about the differences between the bimetallic thermometer and ordinary thermometers. Today Senyao Instrument will popularize the knowledge for everyone! The bimetallic thermometer works according to the principle that two different kinds of metal sheets have different degrees of expansion when the temperature changes. The main component of an industrial bimetallic thermometer is a multi-layer metal sheet, which is stacked together by two or more kinds of metal sheets. In order to improve the sensitivity of temperature measurement, the metal sheet is usually made into a spiral shape. When the temperature of the multi-layer metal sheet changes, each metal sheet expands or shrinks at different degrees, causing the spiral to curl or loosen. One end of the spiral is fixed and the other end of it is connected to a free rotating pointer. Therefore, when the bimetallic strip feels the temperature change, pointers can indicate the temperature on a circular graduated scale. The measurement range of this kind of instrument is -80~650℃, with a tolerance of about 1.5% of the scale. The usage of this thermometer is similar to the stem liquid-in-glass thermometer, but it can be used under conditions of higher mechanical strength. The glass thermometer is made according to the obvious physical property of thermal expansion and contraction of working liquids like mercury, alcohol and toluene. 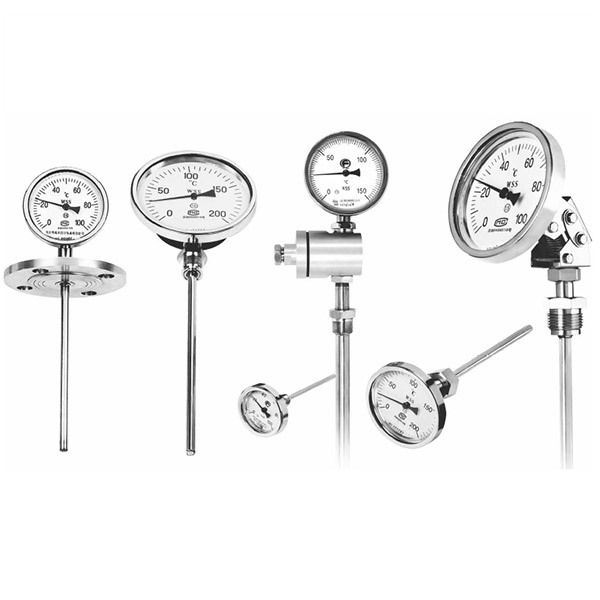 Mercury glass thermometers and electrical contact mercury thermometers are of most use in industrial boilers. A mercury glass thermometer is made of a temperature bulb, an expansion tube, a scale and so on. Generally there are two kinds of it: enclosed-scale and external-scale (also called rod-like). Two wires are inserted into the expansion tube of the mercury thermometer. When the temperature reaches the rated value, the mercury will connect to the wires and drive the control system with the electric current, or make the signaling device give an alarm of sound and light. From the above introduction we can know that each thermometer has different features. According to the different features of their use, we can choose an appropriate thermometer. However, up to now, the bimetallic thermometer is the most used thermometer! It’s an industrial necessity, a life helper!